Missing: E.G. 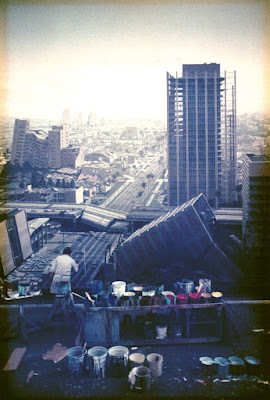 Lutz's Animated Feature "Old Glory"
How do we look at architecture? How should I paint the light in shadows? Will that van stay parked? 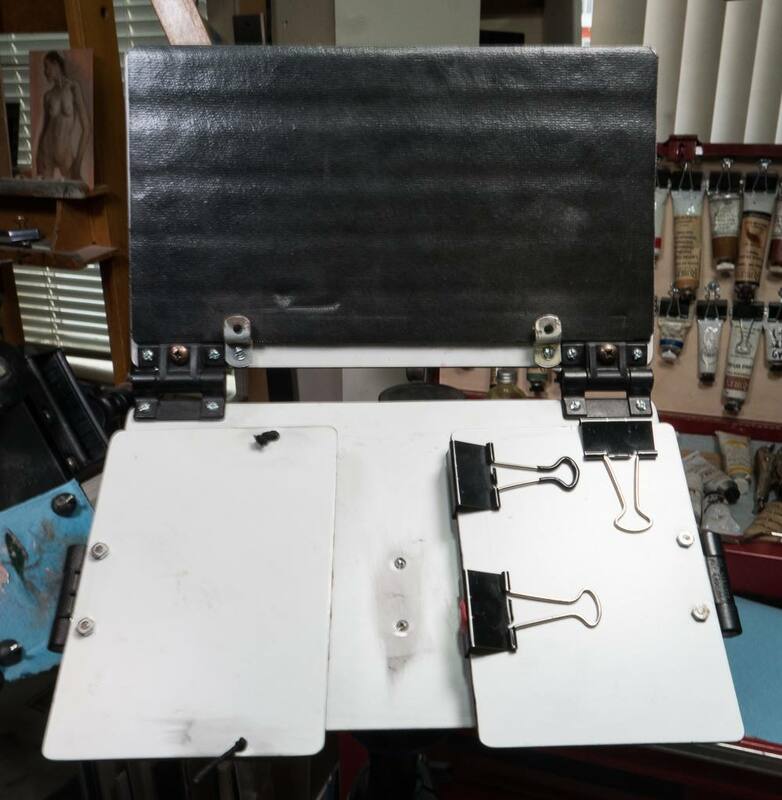 Riko Colin Chock shared the following sketch easel design on our new Facebook Group page. 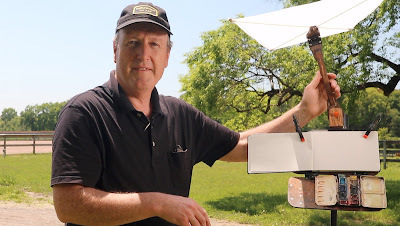 "Here is my easel. Built from ACM (aluminum composite material). The wing with the fountain pen tray liner can be tilted down for brush drying. I stitched it with a cut piece of hair elastic to hold the brushes, pencils, etc. in place. "The palette is held on currently with Blu Tack. I've epoxied magnets to the underside of it and will maybe mount a thin sheet of tin to the platform of the easel. 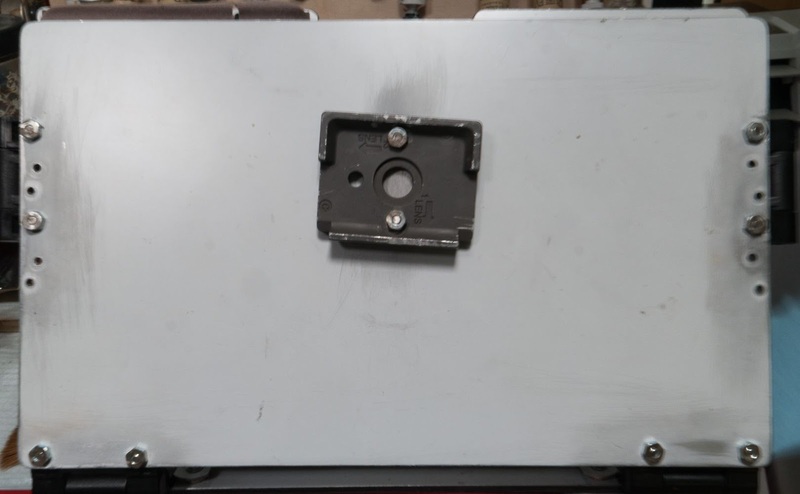 "Canvas clips and clamps hold the bottom of the book/panel. Shelf liner is used to give the book/panel a little bit of grippiness so it doesn't slide around. Water cups have magnets on the bottom and cap which attach to the binder clips and arms. "Folds pretty flat, maybe an inch or so. Pardon the camera shake on the last pic which is the bottom showing the nuts and bolts (and the few corrections on placement!). Also, pardon the clutter in the background! 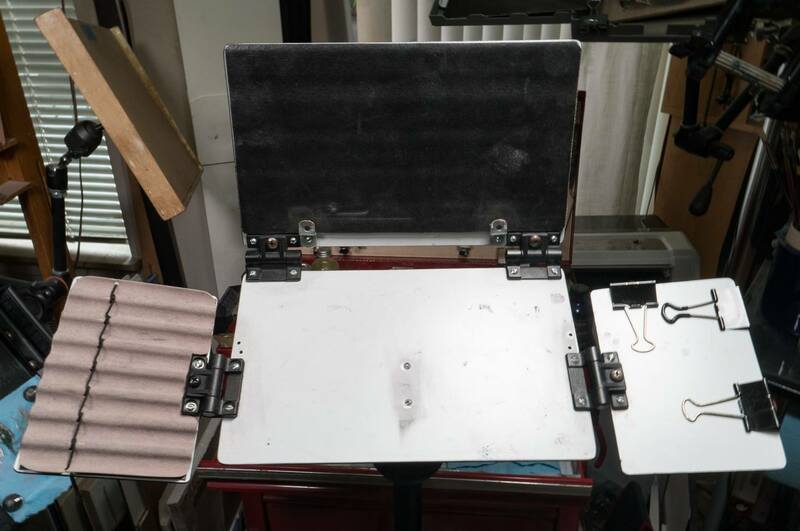 Check out the Facebook group Sketch Easel Builders, and share your design. Here's an improved diffuser for your plein-air easel. It delivers beautiful light on your painting panel or sketchbook, and it's lightweight, robust, adjustable, and easy to build. 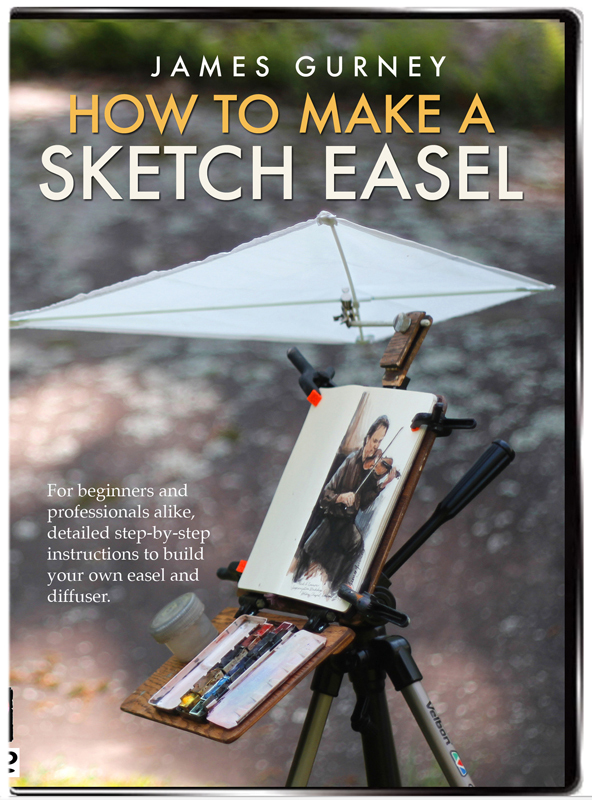 I have released a video showing how to make the sketch easel plus four different diffuser designs. It explains what tools and materials you'll need, and demonstrates all the steps. It's available now from Gumroad and Sellfy. The DVD version is available for $24.50, and it includes a slide show. The DVD is also available on Amazon. 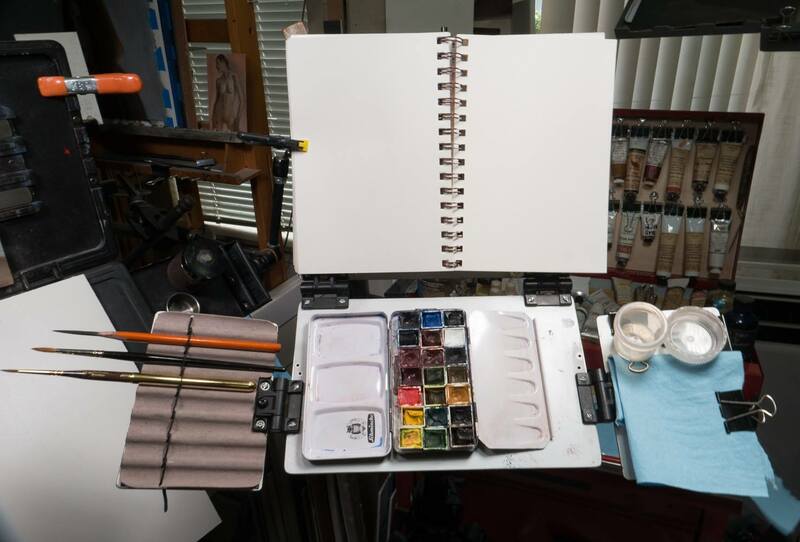 There is also a Facebook group called "Sketch Easel Builders" where you can share your build or ask questions of fellow builders. It's free to join. One hundred years ago to this Memorial Day, animation pioneer E.G. Lutz released a film called "The Story of Old Glory," which chronicles the development of the American flag from colonial times to 1918. The film resurfaced in 1939 for a showing at the Museum of Modern Art, but it hasn't been seen since, and not too much is known about it. Here's an online PDF with more information about the lost film. If you know of the whereabouts of a copy, or if you've seen drawings or promo items from it, please leave a comment after this post, or contact the Illustrating Edwin website. 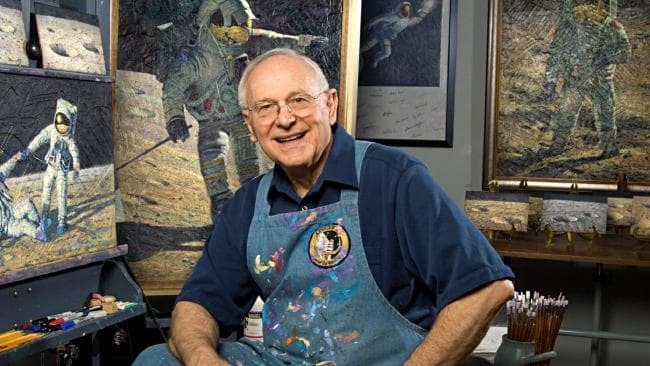 Alan Bean has died. He was the fourth man to walk on the moon and he was also a painter. 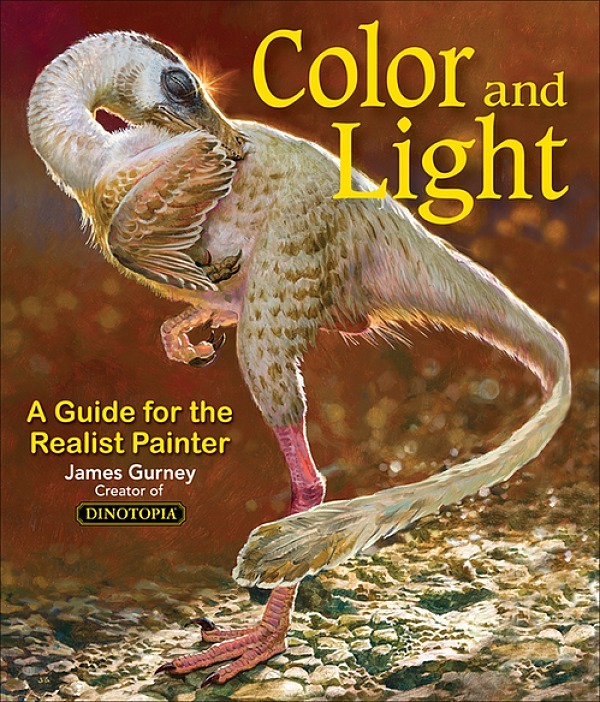 I fondly remember him calling me with focused questions about color mixing. (Link to SoundCloud file). Many people recall him as being a kindly gentleman, and he certainly was, but he also had a test-pilot's tenacious insistence on understanding a subject thoroughly, as if his life depended on it. In my conversations with him, I took the opportunity to ask him about what shadows look like on the moon. He said that from a scientific perspective they really were black (except for reflected light), and the surface of the moon was full of grays. But from his artist's perspective, he wanted to introduce more color into his painting to convey the feeling, as well as the optics, of the experience. He had to be careful during his time at NASA not to talk too much about such things. He didn't want to sound too much like a dreamy artist, or they would have dropped him from the program. As he completed his mission on the Moon, he was observing and recording it in his mind, and after his return to earth he pursued a successful career as a painter. 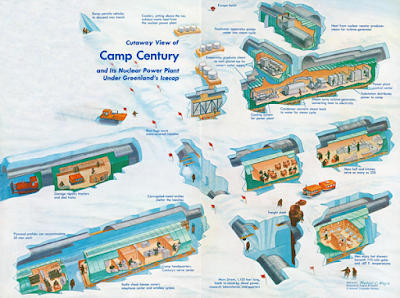 In the 1960s the Army Corps of Engineers undertook a project to build a secret scientific and military base under the ice in Greenland. The official story was that it was a base camp for scientific research under the name Camp Century, big enough to hold 200 residents. 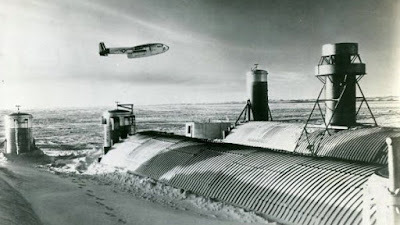 But there was a top secret component that wasn't revealed until later: a planned base for nuclear missiles called "Project Iceworm." A vintage film shows how they built it. What the planners didn't anticipate was that glacial ice is in constant motion, and any trenches or tunnels would eventually fill themselves in, trapping all the building materials and toxic waste under the ice, where it remains abandoned today. NPR: Melting ice in Greenland could expose serious pollutants from buried army base. North Korea has been in the news, but most of what we hear is about denuclearization, summit meetings, and sanctions. But we don't hear much about the art and artists there. 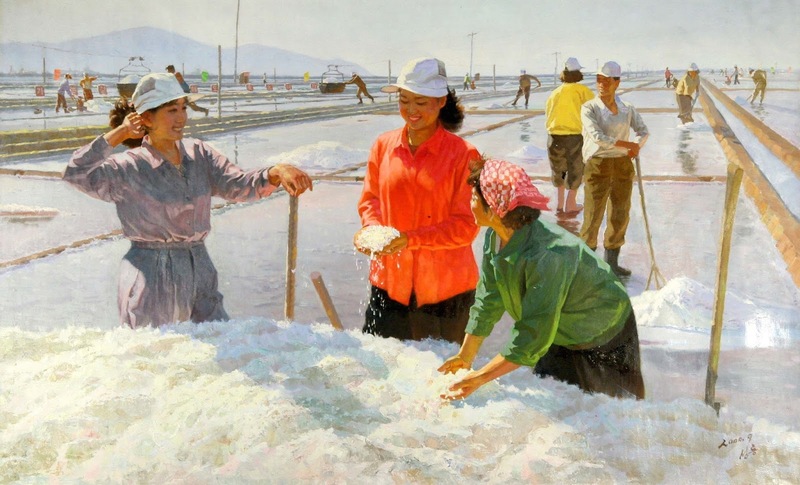 Women Looking at the New Salt Harvest. The dream career for an artist in North Korea is to be a member of Mansudae Art Studio, where about 1000 hand-picked artists paint a range of images: official portraits, history lessons, and pictures for the tourist trade. 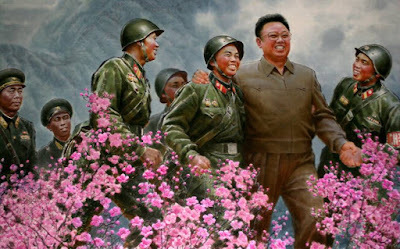 Members of the reigning Kim dynasty may only be portrayed by the artists from Mansudae Art Studio, and they must be shown smiling in heroic leadership poses. 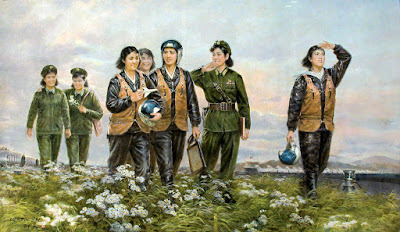 The style of the art resembles the art from Communist China during the Mao era. 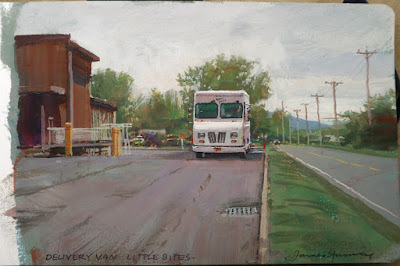 Young artists who follow the path of success in art begin at age nine at specialty art schools, painting set subjects. 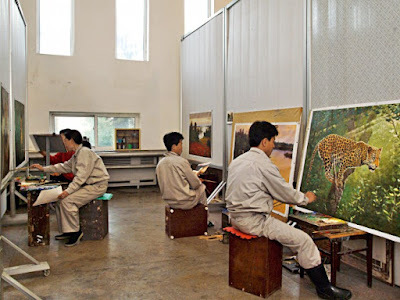 If they pass a series of examinations, they make it into a class of 150 students at the central art academy of Pyongyang, and hopefully qualify to join Mansudae. 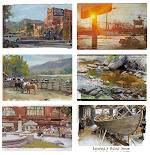 A typical artist paints 30 paintings per year, working four days a week. The 5th day is reserved for community service. The artists don't all paint oil canvases of political scenes. 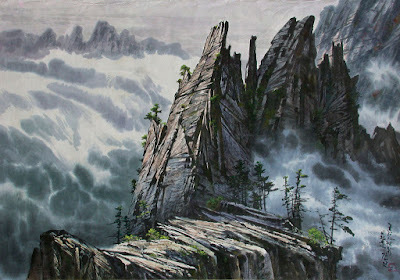 They also paint misty mountain landscapes in traditional ink wash. There are also artists who specialize in pottery, other traditional crafts, and sculpture. 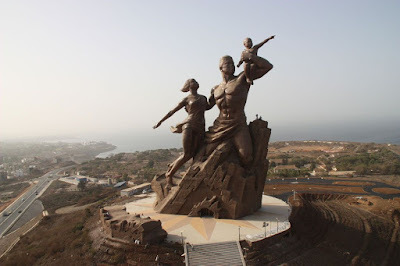 Some of the sculptors from Mansudae have worked for African countries to create gigantic monuments. Some American museums have been interested in collecting North Korean artwork, but because of the trade embargo, it's very difficult to acquire them. 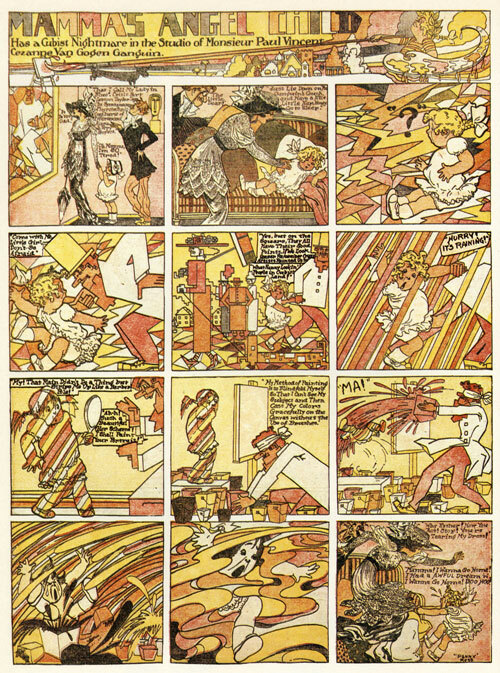 Newspaper comics came of age during the same time that modern art made its appearance, and the comic artists took notice. In 1916, just a few years after the Armory Show, Penny Ross portrays "a Cubist Nightmare in the Studio of Monsieur Paul Vincent Cezanne Van Gogen Ganguin." 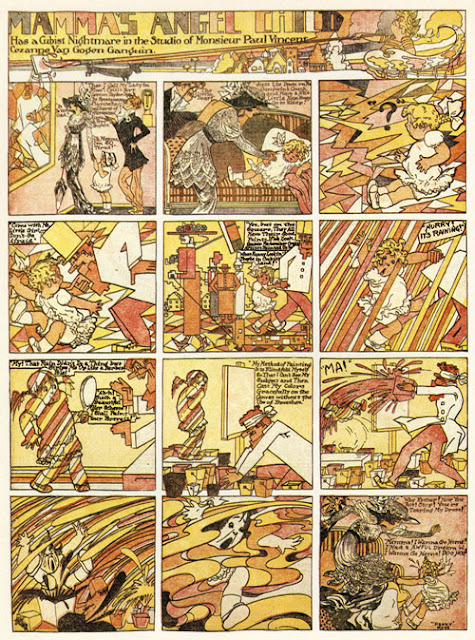 In Polly and Her Pals (1929) by Cliff Sterrett, Paw accidentally tries on his wife's glasses, with disorienting results. 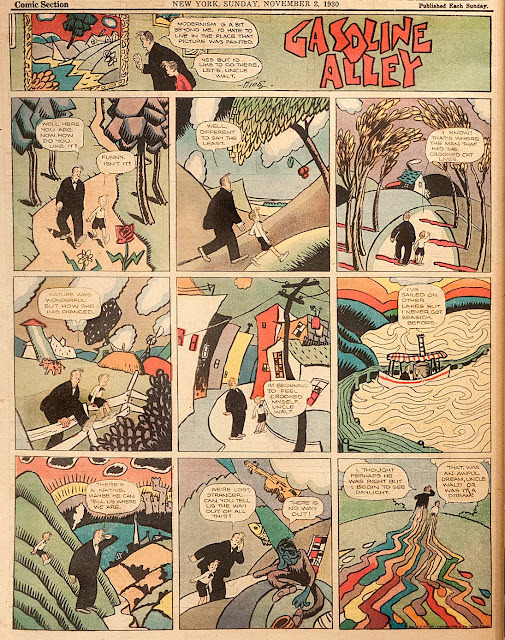 Uncle Walt and Skeezix visit an art museum and find out what it's like to walk around in Modernist paintings, as portrayed in Gasoline Alley (1930) by Frank King. 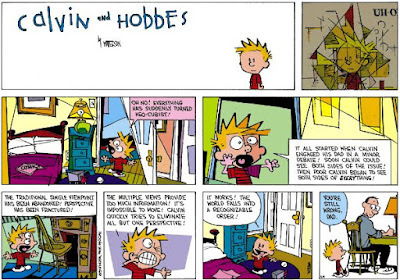 Bill Watterson continued the tradition decades later in Calvin and Hobbes. 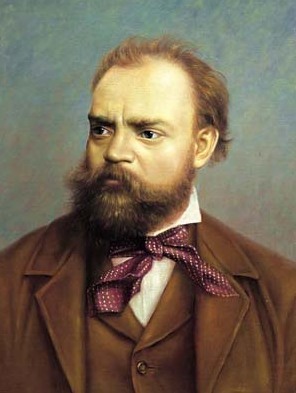 When Czech composer Antonín Dvořák (1841-1900) came to America, he taught students and he wrote music. He wrote The New World Symphony based on the inspiration he received here. In 1895 he wrote an essay for Harpers magazine characterizing the music and the people of the young nation. He said: "The two American traits which most impress the foreign observer, I find, are the unbounded patriotism and capacity for enthusiasm of most Americans." "Nothing better pleases the average American, especially the American youth, than to be able to say that this or that building, this or that new patent appliance, is the finest or grandest in the world." "This, of course, is due to that other trait - enthusiasm. The enthusiasm of most Americans for all things new is apparently without limit. It is the essence of what is called "push" - American push." "Every day I meet with this quality in my pupils. They are unwilling to stop at anything. In the matters relating to their art they are inquisitive to a degree that they want to go to the bottom of all things at once." He wrote this essay during the 1890s, the decade of bicycles. Electricity and the telegraph were newly invented, and comics, animation, jazz, movies, automobiles and airplanes were soon to arrive. The enthusiasm and inquisitiveness he described were at the root of an incredible era of invention and discovery. But, let's remember, many of those inventions were followed by less desirable outcomes that no one could have predicted, such as suburbia and the world wars. And we can't forget that women didn't have the vote, and racial and ethnic minorities didn't have equal opportunities. Perhaps Dvořák would have been pleased to see his symphony performed by such a diverse orchestra (this was the first performance that came up on a Google search). But I wonder what Dvořák would make of the zeitgeist of our arts culture now? Have we lost some of that enthusiasm and confidence? Have we become jaded, cautious, and cynical? Antonin Dvorak's essay "Music in America"
Where do we put our attention when we look at a building? Here's a photograph of a Civil-War-era field hospital with an eye-tracking heat map overlaid. 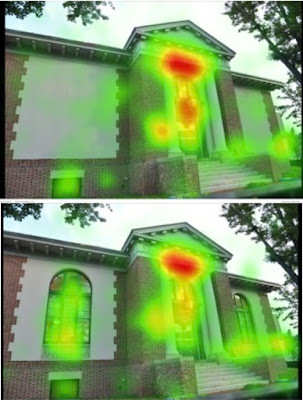 It shows that observers pay the most attention (red and yellow areas) to direct human presence. There's a figure standing in the doorway, and a group of other figures to the left. 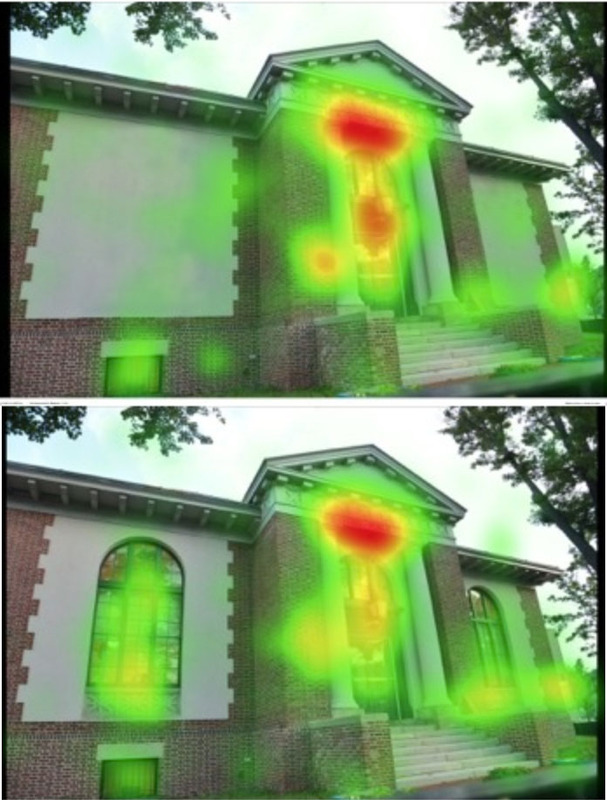 The interest in the upper windows appears to be a search strategy for finding other people, or at least for learning about human presence indirectly. No one looks at the ground, the trees, or the chimney. What if no people appear in the photograph? How do we respond to the purely abstract elements of architecture on their own terms? 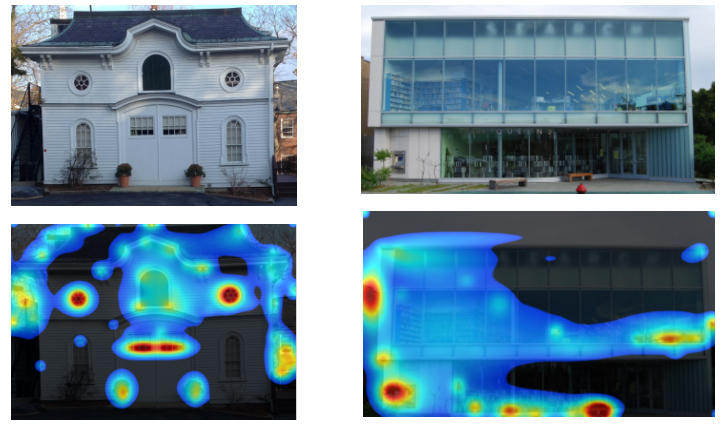 Here are two photos of a building, one with the side windows removed by Photoshop. 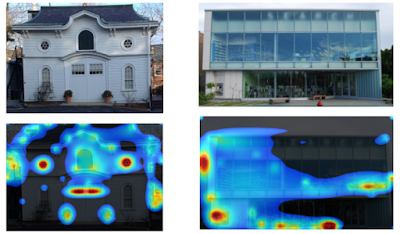 Researchers Ann Sussman and Janice Ward have discovered from such studies that "People ignore blank facades. People don’t tend to look at big blank things, or featureless facades, or architecture with four-sides of repetitive glass." They also observed that "buildings with punched windows or symmetrical areas of high contrast perennially caught the eye, and those without, did not." This painting of mysterious conspirators was one of six by N.C. Wyeth that were stolen from a Maine businessman, and later showed up in a pawnshop in Beverly Hills, California. "I was interested to read that you 'need to tell myself to paint the shadows darker than they appear, because the tendency (for me at least) is to overstate the fill and reflected light'. 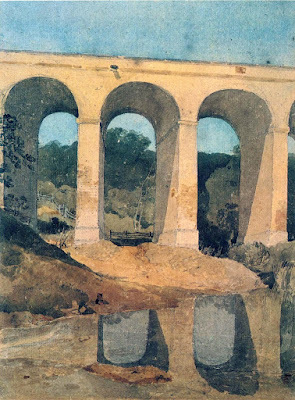 John Ruskin noted that the human eye is far more sensitive to light than photographic paper (I am not sure about digital arrays of sensors) and wanted artists to paint what they could see in shadows and which was invisible in the dark shadows of photographs where shaded details did not register. He also deplored the Claude glass for the same reason." Thanks for those interesting thoughts. Ruskin is correct in saying that our eyes can see more light in shadows than cameras can see, especially any cameras that he would have known. 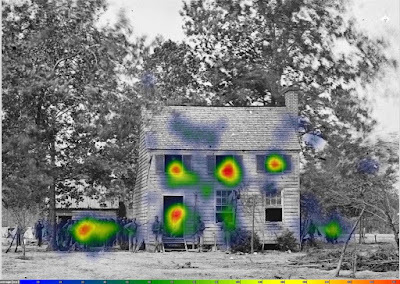 19th century cameras had much less latitude than modern digital cameras are capable of. He's also right that usually we want to avoid indiscriminately copying black shadows in pictures. But lighting and value organization were never Ruskin's strengths, so I take his opinions about light and shadow with a grain of salt here. I would hesitate to draw any single conclusion about how to treat the light in in the shadows in a picture. There are times you may want to paint shadows black, especially if you want drama. Other times you might want to flood the shadows with variations and bleach the lights. 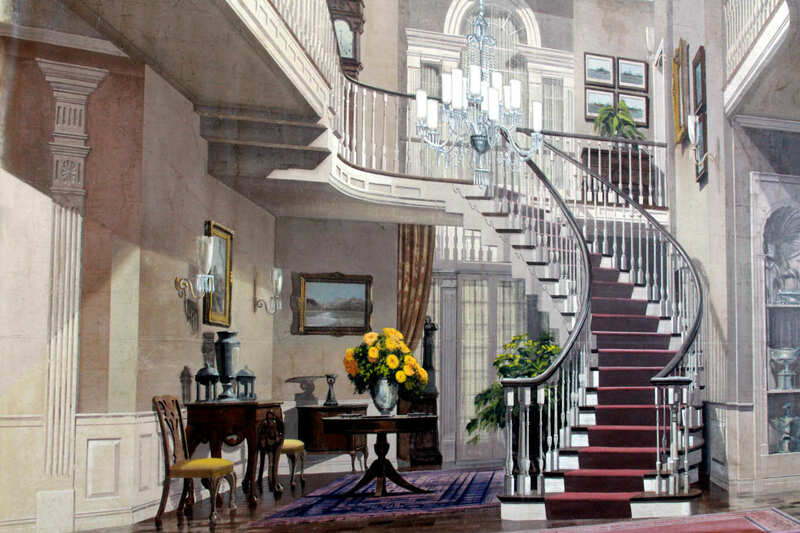 It depends on the nature of the lighting and your goals in a given study or painting. If my goal in a picture is to capture a sense of light, I'll want to group the shadows and separate them from the lights. 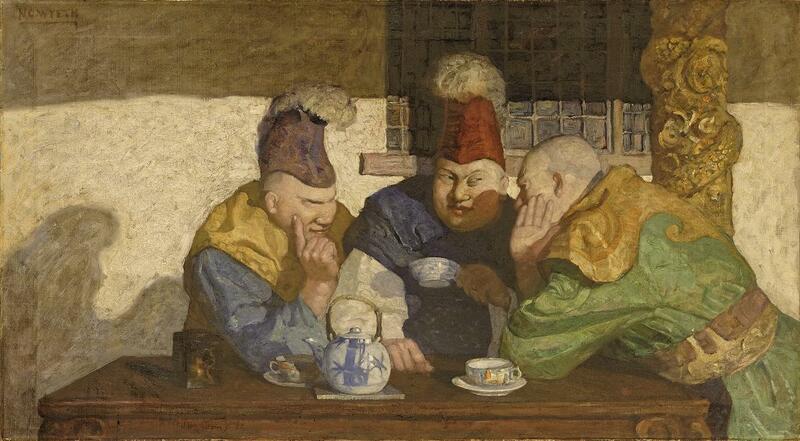 I think John Sell Cotman does that beautifully in the painting above. The tones in the shadow are kept together, even though they're not too black. 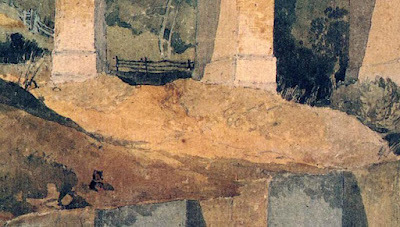 Using a (Claude) Lorrain mirror can help in seeing these tonal relationships. It shows the darks all merged together as a mass -- even though you don't have to paint them as black as you see them. 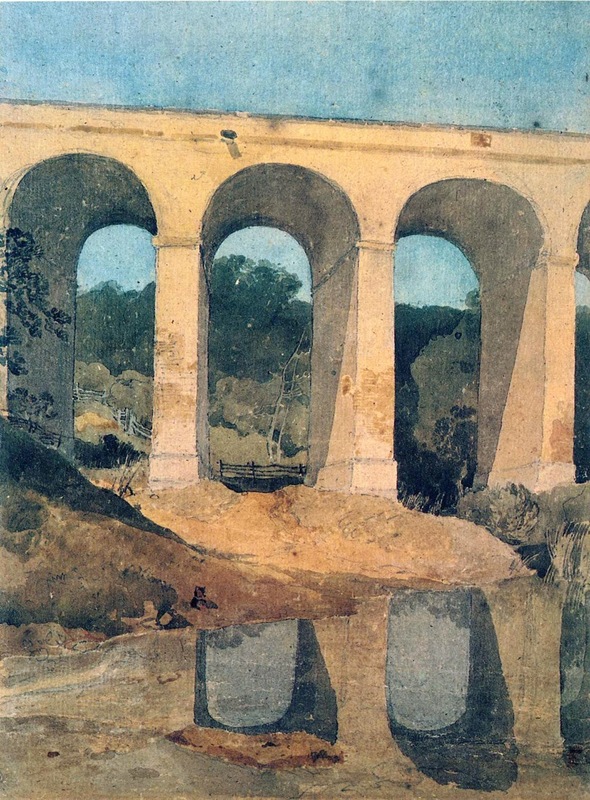 And look how Cotman unifies the illuminated areas at the base of the aqueduct. It would have been very tempting to put a lot of dark accents and texture into those lights. 1. Paint gives us a very limited scale of values to work with, so management of tone is essential. 2. To achieve a feeling of light, focus on grouping the shadows, simplifying them, and separating them from the lights. 3. Your reference won't give you the value organization. You have to invent it. It requires a leap of your imagination and a remarkable level of discipline to pull it off. A previously unknown painting by Rembrandt van Rijn has been confirmed by experts. When the portrait came up for auction, identified as by the "School of Rembrandt," Dutch art dealer Jan Six suspected it was the real thing. That lace collar was only popular for a couple years, and those years were before Rembrandt's style was influential. 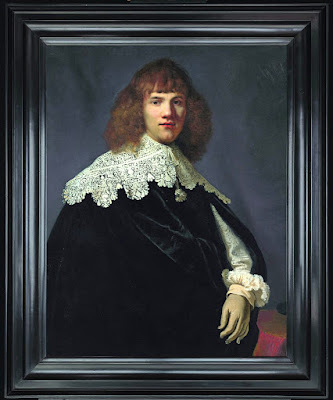 "Portrait of a young Gentleman is the first unknown painting by the Dutch master to turn up in 44 years and takes his total known painting oeuvre to 342, the NRC reported on Tuesday. Six bought the work 18 months ago at an auction at Christie’s in London on a hunch. He paid the equivalent of €156,000 for the portrait, which is undated and unsigned but which was probably painted in 1634. The portrait, measuring 94.5 cm by 73.5 cm, was sold by a British family who had had the painting in their possession for at least six generations. Six worked with Rijksmuseum experts to authenticate the work, and argues that the primer, pigments, brush strokes and method of composition all point to it being by Rembrandt." It's grocery day, so while Jeanette does the hunting and gathering, I am out in the parking lot scouting for a new slice of ordinariness. Here's a short video (link to video on Facebook). 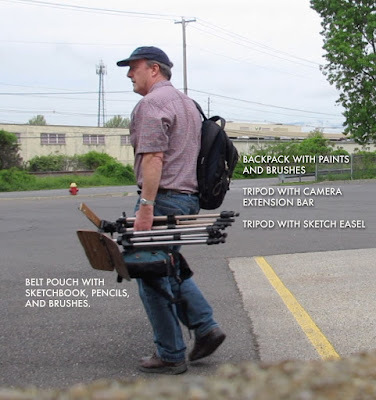 I use two tripods, one for the sketch easel, and the other for the camera, which is held out on an extension bar. The camera I'm using is a Canon EOS M6 mirrorless, which has a built in time lapse function. Here's my setup (product links below). The casein underpainting color is just a random page; I didn't paint it for this particular composition. I just like to have a few pre-primed page in the book. The priming gives unexpected energy to the colors. The sky is overcast, making the sky flat and nearly white. With overcast lighting, there's no clear light side or shadow side. On the van, the planes that face more upward receive more light from the sky and are therefore lighter. I liked the fact that the white on the hood of the van was the brightest white in the composition. 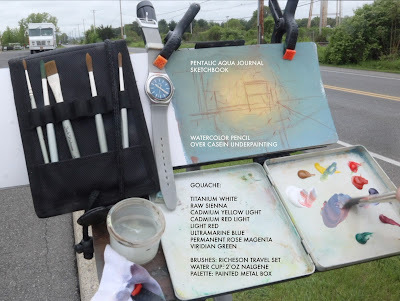 The brushes are from a pocket travel brush set and I'm painting in a Pentalic Aqua Journal with gouache over the casein underpainting . Everything is attached to the homebuilt sketch easel. I made a video explaining how to make one. Full-length painting tutorials on Gouache, Casein, and Watercolor. Here are two videos that demonstrate some gouache techniques resembling those used in background paintings for Miyazaki's Studio Ghibli. He pre-mixes four colors before starting on the sky: a lighter and darker blue for the gradation of the sky, plus a white and a gray for the lit part of the cloud and the shadow part. 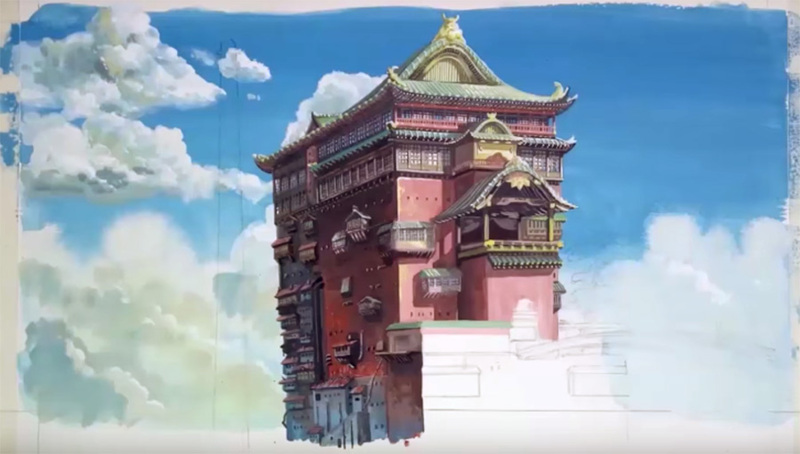 Artist Victor Ishihara demonstrates creates a painting of the building from "Spirited Away" (Link to video on YouTube). I'm not sure what Mr. Ishihara's connection is with Studio Ghibli, but his way of painting seems fairly similar to that of Mr. Masuyama. 1. The art is set up flat on the table, so the method doesn't depend on gravity to pull down washes. 2. The paper is pre-wet for the sky, which helps achieve those soft edges in the clouds. 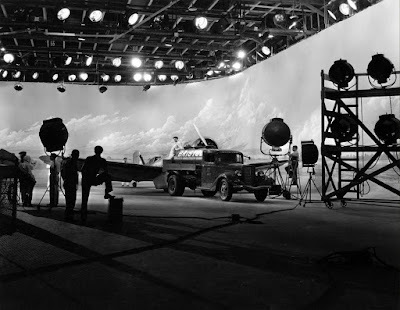 A coffee table book called The Art of the Hollywood Backdrop showcases an art form that is often overlooked because it is designed to be invisible. Backdrops, or "backings," as they are called in the industry, are huge painted panoramas that fill in the setting behind the live action. Unlike matte paintings, which are smaller-scale paintings that are optically combined with the action, backings are actually positioned on the back wall of the set. Sometimes backings are used where you don't expect to see them, such as an interior setting, which can be easier than building a set or shooting on location. 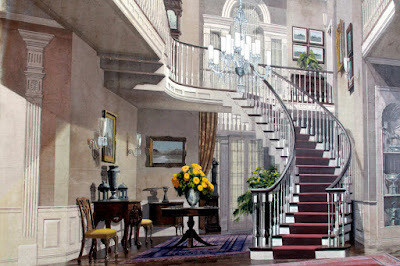 This painting is 13 feet tall by 20 feet wide, and was used multiple times as a rental from the inventory of Coast Backings Corporation. Above, scenic artist Ben Resella paints a backing for Earthquake, (1974). The book is organized into three parts: first, an introduction that explains the history and technique; second, a survey of the main artists and companies that dominated the industry; and third, an essay on the future of the hand-painted backing in film. 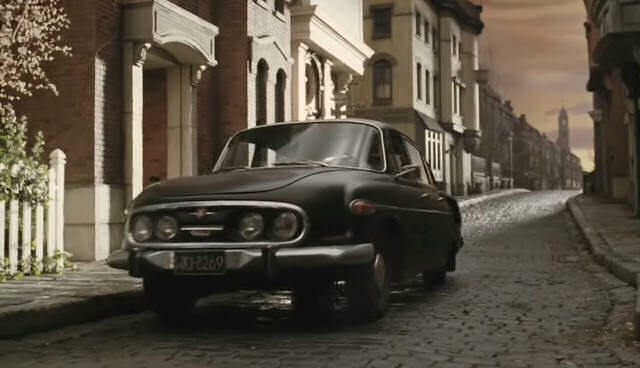 Even though backdrops have been largely replaced by CGI techniques, they're still used for productions that want to achieve an other-worldly look. Backdrops were used extensively, for example, in the 2004 movie Lemony Snicket's A Series of Unfortunate Events. The book The Art of the Hollywood Backdrop is a lavish, oversize coffee table book, 324 pages, hardbound, slipcased, with huge photo reproductions that spill across its 11x14" pages. One of the co-authors is Karen Maness, an atelier-trained painter who teaches at the U.T. Austin's Department of Theatre and Dance. Sheworks as a Scenic Art Supervisor at Texas Performing Arts, and recently co-founded the new Atelier Dojo. Related titles: The Invisible Art , about the history and methods of matte painting, written by veteran matte painter Craig Barron. Windows on Nature: The Great Habitat Dioramas of the American Museum of Natural History , which features the diorama illusions of James Perry Wilson and Duncan Alanson Spencer, who painted background illusions both for movies and for museums.